Architects and designers SHH have completed a new London office interiors scheme for a private company in London’s west end, working closely with client-side design director Zeljko Popovic. The Manchester Square offices are the result of a brief to create a ‘high impact, 21st century office interior with a strong personality’ with more in common with a gentlemen’s club than a traditional office space. 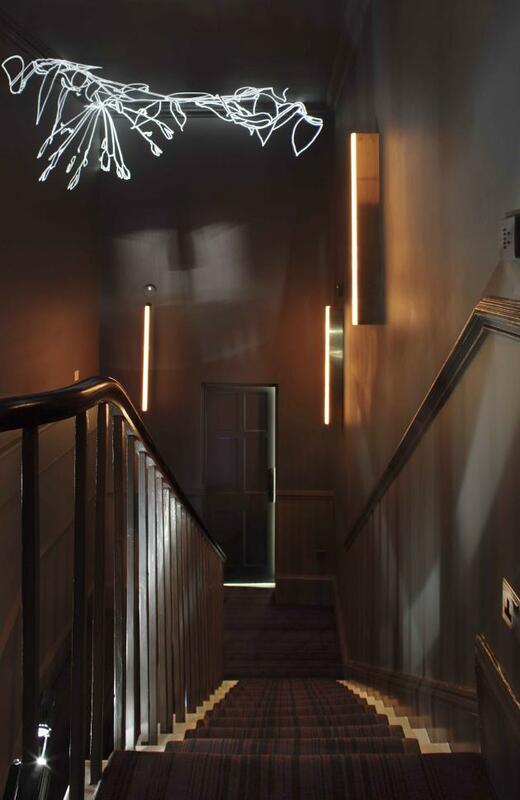 Although the property was made up of a classic (and Grade II-listed) Georgian townhouse with a former stables and garage mews building to the rear, the client was very open to a sense of contrast for the scheme, favouring a highly contemporary treatment. The inherited interior – also previously an office – was not particularly grand, but any standout details were to be retained (such as marble mosaic floor tiles in the entrance area, a number of marble-inlaid fireplaces and highly detailed ceiling cornicing). The building has five storeys and the rear mews has two storeys, with the upper ground mews floor corresponding to the ground floor of the main space. The original connection between the two was via an open courtyard, which SHH have now partly built over to form a covered walkway between the two for all-weather access. 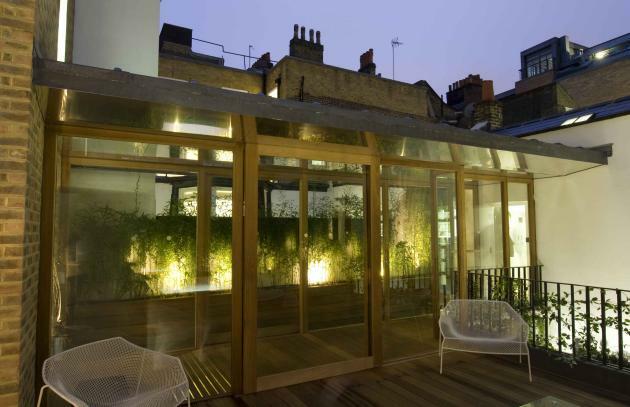 The new project remit covered the Upper Ground floor of the mews and the ground, first and second floors of the townhouse building (with the third storey retained for possible further expansion). 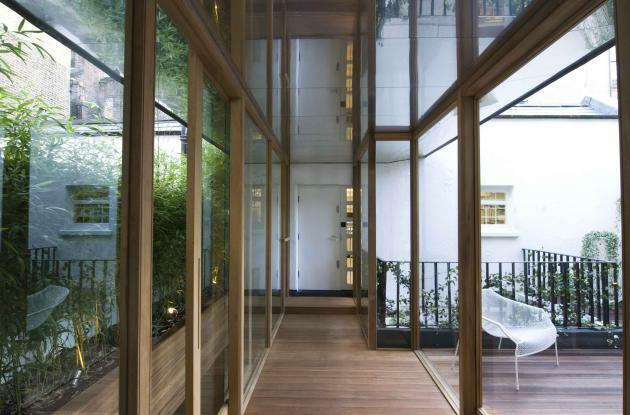 ‘The spaces benefit from good natural light’, commented SHH Project Designer Brendan Heath, ‘with typical tall Georgian windows to the front and a double aspect thanks to the rear courtyard. Ceiling heights at the front of the building are also spectacular – between 3.6 and 3.8m’. The scheme begins at the ground floor main entrance, where the existing mosaic flooring was retained and cleaned. For the rest of the flooring on this level and also on the first floor, black-stained white french (FSC-certified) oak was used in a herringbone formation. By the second floor, the age of the existing flooring was more of an issue as significant bowing had occurred. 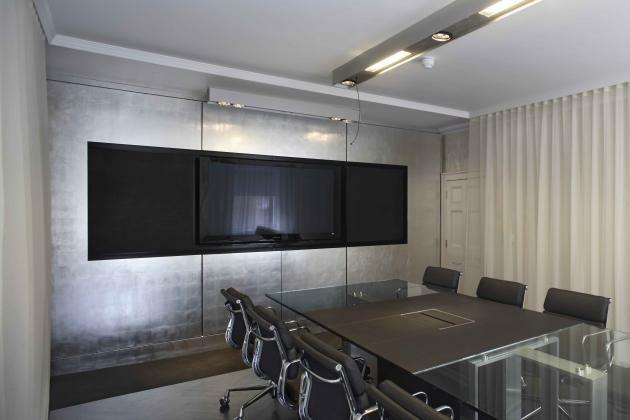 This gave the designers a direction on the design of the second floor meeting room, using a raised ‘stage-set’ platform (whilst the videoconferencing room once more uses the black herringbone timber). Accent lighting on the project was provided by Modular and is combined with more dramatic pieces, such as the executive office pendant lighting by Foscarini. 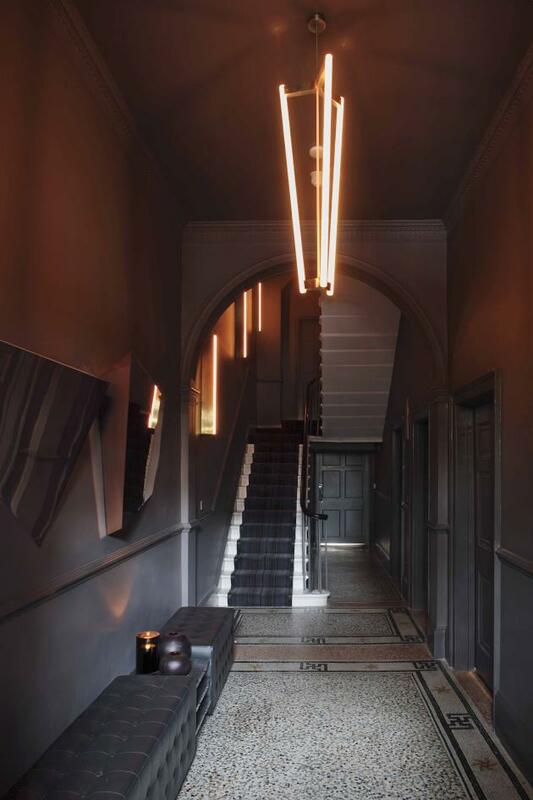 The entrance area has walls lined in dark grey velvet drapes to create a theatrical entrance, with the rest of the hall and stairwell painted in a matching dark grey hue all the way up. A bespoke 3.5m long bench to the left of the entrance makes a statement in buttoned leather with marble inserts (whilst functionally concealing a radiator), made for SHH by Naught One. Two statement contemporary chandeliers, made to order and designed by Michael Anastassiades, are visible from the exterior and are joined by two limited edition copper mirrors, which are equally spectacular, projecting out like blades of light, giving unusual reflections and playing with proportion. The lighting treatment is completed by Michael Anastassiades’ ‘Tube’ wall lights: vertical 1m bronze bars with incandescent lamps, running the full length of the stair. The final addition to this dynamic arrival space is the first of four wall projections by artist Hugo Dalton, commissioned via fine art consultant Tanja Gertik. The artist produced a series of sketches of ballet dancers morphed with floral motifs, which were then laser-cut onto stainless steel disks, which were fitted into ceiling-mounted projectors. 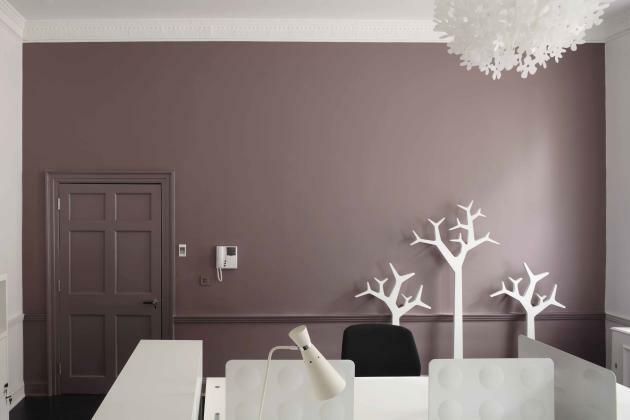 The reception, to the rear of the ground floor hall space, is all white with one purple wall to create a slightly softer and more welcoming space than the daringly dark remainder of the scheme, with white desking and a giant mirror on the chimney breast; a contemporary take on a baroque frame in opaque acrylic. 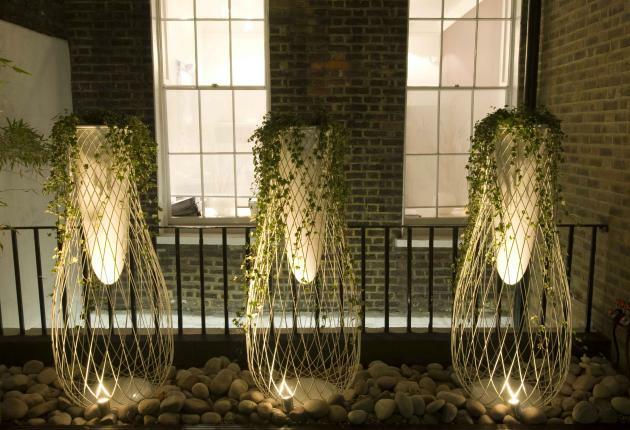 Swedese white, tree-shaped coathangers add an abstract touch to the space. The first meeting room is at the front of the main ground floor space. Painted in mid-dark grey, the room features a high-gloss white-sprayed Techno table, eight Eames lobby chairs and a white sculptural credenza by Bross (also used for the first floor office spaces). 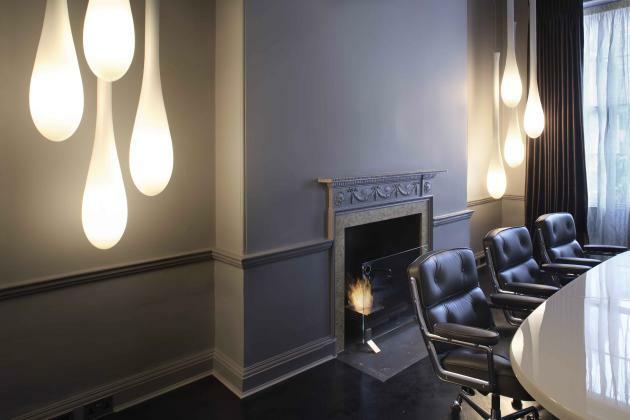 A second Ingo Dalton projection takes up most of one of the shorter walls in the space, adjacent to one of two corner clusters of four glass drop pendant lights of varied lengths, by Vistosi. The first floor offices are in pale grey and feature executive desks in black leather and aluminium by Estel, together with white leather chairs by Tacchini and aluminium silver chairs from Interstuhl. The second floor stair (part of a double-height space) features the third and fourth of the scheme’s Hugo Dalton projections. The videoconferencing room has a new wall to house the large plasma screen at its centre, which is surrounded by aluminium leafing, whilst the rest of the room is in a silver wallpaper. The second meeting room, with the raised platform flooring using a woven vinyl floortile, features olive green Arne Jacobsen ‘Oxford’ chairs, set around a Jean-Marie Massaud meeting table from Porro. Three sides of the room are screened with white voiles to enhance the theatrical stage-setting theme, whilst the fourth wall is hung with a Tord Boontje ‘Little Field of Flowers’ felt rug from Nani Marquina. 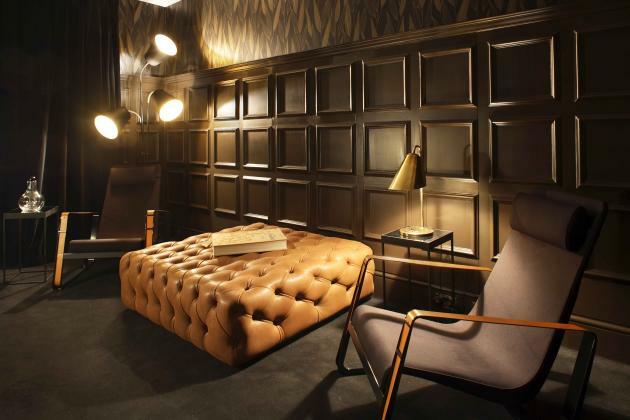 One of the richest-coloured spaces in the scheme is the final room: the breakout room, in dark chocolate brown. Here, SHH raised the wallpanels to 1500mm to allow more detail, with hand-painted wood in chocolate brown and wallpaper above the panels in brown and gold. The room contains a deliberately eclectic mix of furniture, from the classic Cité armchair by Jean Prouvé (manufactured by Vitra), to vintage 1930’s and 40’s lamps from Sigmar London, a sleek credenza from Italian manufacturer Acerbis to a large studded leather pouff from DePadova.